Proxy-N-VPN is another great dedicated proxies provider! They offer dedicated static IP Proxies for high anonymity, SEO tools, and social media marketing. Proxy-N-VPN offers HTTP/HTTPS proxies running on high end, dedicated proxy servers. Their IPs are non sequential. They provide both private proxies and shared proxies. Dedicated proxies are good for Craigslist, Instagram and Ticketmaster. Founded in 2012, Proxy-N-VPN swears by their ambition to protect their users’ online privacy and security. They’re a leading company in providing online privacy for whatever your needs may be, whether that’s just surfing the web with peace of mind, or if you need highly anonymous proxy services for your business. They’re a green company, operating on a state of the art facility that keeps energy emissions down while also saving money for their customers. Their high speed, anonymous private proxies are optimized for SEO Tools Like Scrapebox, SEnuke, TweetAdder, BookmarkWiz, Ingerslike, Tweet Demon. Their proxies are known to be especially great with Instagram and Facebook. They cost a little more than some other providers, but they’re definitely worth the price. Also, their proxies are good for social media, web scraping and work on all classified ads site. They give you the ability to do webmailing but not SMTP mailing, so keep that in mind when considering this provider. 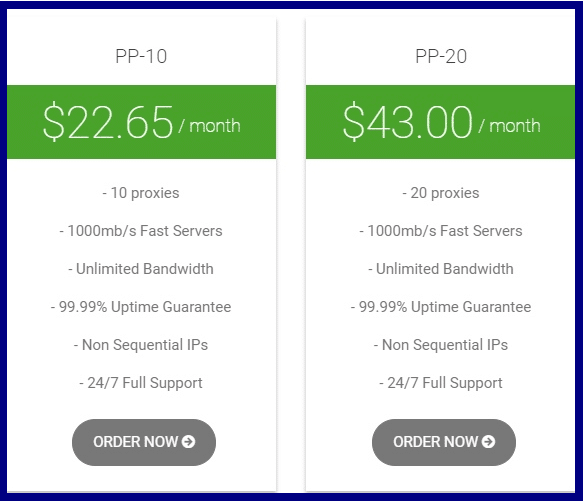 Their prices are pretty standard fare compared to most other top end proxy providers. They also offer a wide range of proxy servers for just about any needs, so you shouldn’t have too much of an issue finding a package that best suits you. You can purchase proxies from Proxy-N-VPN through PayPal, Skrill, 2Checkout, Payza, and CoinGate. They do not accept credit card payments, but luckily their other options are relatively popular methods or paying. They also offer a 3 day refund policy. However, there are a lot of strings attached to this policy, so make sure you look it over before counting on being able to use it. The Proxy-N-VPN service provides anonymous private proxies on reliable X3430 dedicated servers with CentOS, and more than 10,000+ dedicated IP addresses on sales. Their servers have 99% uptime, as well as unlimited bandwidth. There’s never any down time with their servers. And there’s no set up fees! So you don’t have any reason to worry about the speed and quality of their servers; these truly are some of the best, and you should never encounter any issues. And if you do, their 24/7, year round support will make sure that your problem is handled properly. 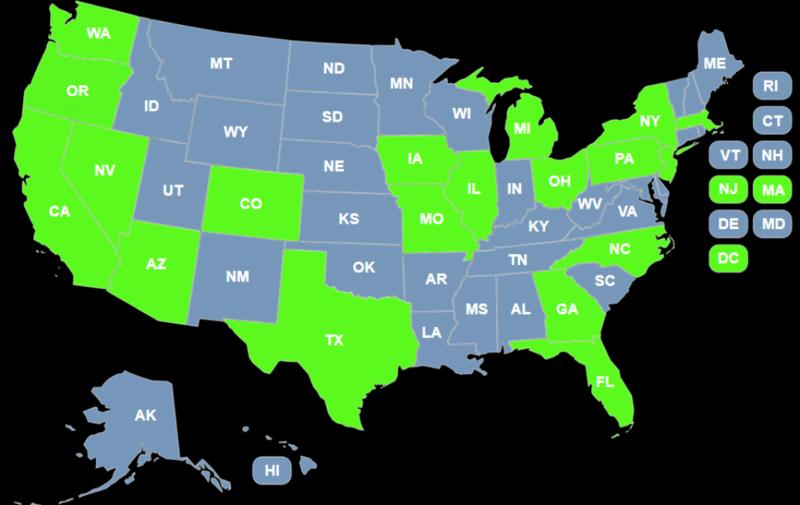 Proxy-N-VPN mainly provides USA based IPs, with locations in 27 US Cities. You can easily get GEO location specific IP addresses for posting ads on Craigslist and other classified ads sites. This is a pretty small map for the time being, so hopefully they expand on it. They do offer a decent amount of locations though, and for the most part you should be well set with what they have to offer. Just make sure that these locations work for you before making any purchases. They also offer UK proxies and France proxies, should your needs be outside of the US. Again, hopefully they will further expand their locations and offer more international areas. You are able to download your proxies from your billing control panel. Your proxies are typically available very fast, so you can quickly get to work with using your proxies not long after buying them. Not only do they offer proxies, Proxy-N-VPN also provides private VPN and shared VPN services for anonymously browsing the internet and bypassing/unblocking content filters. Their private VPNs are just $6.50 per month. So if a VPN is what you’re in the market for, these are a great option. While the Proxy-N-VPN website is a little repetitive at times, it is full of helpful information and very easy to navigate. Choosing and purchasing a proxy or VPN package is very simple, and they make all of the options very clear. It is also very easy to find and access the customer support section of the site. They have a blog that has a few helpful articles for those new to the world of proxies and VPNs, however, it doesn’t seem like they’ve updated or added to it in a while, so I wouldn’t consider it much of a resource. There is also a Frequently Asked Questions section on the site, with lots of helpful info about the terms and restrictions on their proxies, as well as simpler questions that explain how proxies work and what they can be used for. Their dashboard for managing your proxies or VPNs is also very simple and easy to use. All around, it’s a great and simple website, though it could do with a little updating. Proxy-N-VPN has an email and ticket based customer support, similar to other proxy providers. They offer 24/7 service, so you can reach them at any time. However, they are a little slower to answer the ticket compared to HighProxies, MyPrivateProxy, and a few others. I think this is an area where they could improve, and I expect that with time they will. If you are already a Proxy-N-VPN customer, feel free to share your review in the comments below! You can get 15% recurring discount,Use Promo Code: 15OFF. Proxy-n-VPN provides anonymous private proxies for marketing purpose and Achieve rapid development in recent years. Professional approach, great customer service – in my IM career I tried a lot of proxies, but with proxy-n-vpn I got best of everything. Quality proxies, professional support, almost instant deliverability and you can easily manage your proxies within their members dashboard. Probably best private proxies on the internet, even if price is a little higher, you will receive top notch private proxies that you can use for almost anything you want. I’ve been drilling the 10x proxies on submissions and Google scraping and they have have been keeping up just fine. I give this service an easy 5/5 – top marks. This is easily the best proxy providing website I’ve come across. I am with proxy-n-vpn for almost 10 months and I never had any issue with them. I am very satisfied with these private proxies, price and speed. I can honestly tell that I am very happy customer. My favorite proxies, and I never experienced any problems with them, so good for me. Perfect proxies for social media marketing and for YouTube, if you know how to use these proxies. Professional company and I will recommend it to anyone. I am with Proxy N Vpn for almost 8 months and I never had any issue with them. I was blown away when I ran a speed test and saw that the up/down speeds are identical to my main internet connection – virtually no difference whatsoever. Having dealt with super-slow proxies in the past, I really appreciate how much more enjoyable it’s going to be to work with this one. Can’t recommend enough. Thank you so much. I bought a bundle of Craigslist proxies and had a horrible experience. The speed was extremely slow inside Craigslist, but normal speed surfing the web. The IPs were not showing the region I asked for too. They all showed Los Angeles. I asked for a refund in their three day window and they ignored me. I do not recommend them for Craigslist. i want to know if your proxies works with twitter? Their proxies works for twitter, you can sent a ticket to @proxy-n-vpn. You can get know more about it. My favorite proxy provider, I am member since 2013 and I am not thinking about switching to another proxy provider. Very happy and satisfied with their proxies..5 stars, recommended to everyone. I’ve been drilling the 20x proxies on submissions and Google scraping and they have have been keeping up just fine. And on the occasion that a proxy does get burned out or isn’t working when issued, they are replaced very swiftly after I open a support ticket. These proxies are lightning fast. I personally used them mainly for CL and had zero issues. I also tested them for different sites and they are definitely virgin ips. Proxies like these are very rare. I’ve been using the proxies the past couple weeks and they are working great! Fast speed, all worked, and all were fresh. Will definitely buy from Proxy-N-Vpn again! The proxies speed and response time are awesome, doubtfully you can find better quality private proxies. Scraping search engines, Facebook and Twitter posting/analyzing and general “hide my IP” functionality is top notch. Great service and they seem to know the importance of not keeping their customers waiting. I’m using these proxies with Scrapebox and they are very very very fast! I contacted support and they answered in less then 10 minutes providing the best solution for my needs. The private proxies work super well. Had some problems with multiple proxy services and it all stopped when I switched to these guys. I find a lot of services end up giving out proxies that have been more than abused and are banned in multiple service. With THIS SERVICE, you get quality, as promised.